My legs aren’t strong enough to carry my weight. It’s a strange thing to see, much less to live through. These days I find myself constantly dipping into my arsenal of positive mantras. Oftentimes, nothing seems to cut into this abyss of misery. Thank goodness my wheels for my wheelchair arrived! You have been on this ride with me for awhile. I hope I don’t often come across this somber. I think it’s because I’m seeing a habit forming. A “new normal”, if you will. I can use my walker around the house. But it’s getting harder to do even that much. I had a revelation the other day, no matter how much physical therapy I do, it will only carry me as far as MS will let me go. Does that make sense to you? Because it’s taken me years to get that lesson! I’ve left many gyms crying in defeat. On another note, I find that going out to our usual hangouts in the French Quarters is starting to bring to the surface lots of negative emotions. How do I deal with that? “Bibliotherapy” (I made up that word.) The definition is: have a problem? Get a book and read about it. Simple. Libraries, bookstores, Kindles are all fair options. Well, a book I read a while back comes to mind here. 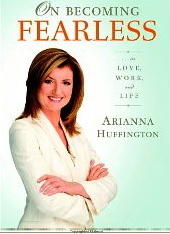 In On Becoming Fearless, by Arianna Huffington she stresses that I should still do whatever it is I’m afraid of, but instead do it with the fear. She’s not expecting the fear to dissipate. It stays but in essence it becomes powerless over me, because I have resolved to do it with the fear. I’m doing it anyway. Instead of expecting it to go away, I tolerate its presence and keep moving forward. In my case it may be going in a crowd of able bodied individuals being the sole person in a wheelchair. What’s yours? At least I’ll be rolling through downtown in style with my pimped out chair. Vanity never fades!! LOL! Mondays and Wednesdays 1 to 3 p.m. I have chronic fatigue syndrome and anxiety. I hope it’s ok to chime in even though I do not use a wheelchair. I am trying to be not fearless, but to have less fear. My anxiety is chemical, and make it very difficult. Yet I am trying to do what I can within my limits and accept the limits. It can be very upsetting. And yet, fighting “what is” is exhausting as well! I just read that worry is like a rocking chair. You think you’re doing something, but you’re really not. I just lost a friend to cancer. He kept his heart open until the end. We are all courageous as he** even when we think we are weak. Thank you, Nicole. Bibliotherapy: awesome word!! I might have to borrow that one. One of my therapies of choice, for sure. I haven’t copyrighted it yet! So be my guess! I’m fighting anything wheeled. I just went to Home Depot and they offered me one of those powered scooters and I declined. Not a smart move! I”m edging closer, thanks for your inspiration, Nicole. Erika, I had to take it slow. Bryanna, I’m not even sure how to use Reddit right! I’m glad I must have done something right. Thanks for dropping by and yes please do come back! I often get frustrated because I can’t do what I use to, but you can’t stop trying. Especially with exercise! Today, I might be only able to do two push-ups…but by golly, tomorrow I will try again to do three. It is just what we have to deal with. As for the mobility aids, I kicked & screamed like a three-year-old, but now I have accepted my cane & rollator & wheelchair. My wife said “you either use them and go with us, or stay home.” Some may say those are tough words–but you gotta live life. Keep moving. Don’t give in. And never, NEVER give up. My Odd Sock, That was soooo nice and needed. I even read it to my mama! She belongs to many caregivers that witness the bad days! And there are days when I want to swap the cane for a wheelchair. I am looking about for one. Wednesday brought it home when taking daughter to the airport – they had handy disabled parking in the car park – but the car park seemed miles from the actual airport – a long concourse, then a long way to check-in, then further past the shops to the coffee shop/bathrooms, and further to the farewell/departure point – and then all the way back. Also the stress of not wanting to be late and sending daughter ahead with hopes not to ‘lose’ her. Anyway, enough moaning, but I can see a ‘freedom factor’ in getting a chair. I guess I have reached the stage that I don’t care what it looks like, it is about me getting from place to place efficiently (but I will pimp up the chair!!). Nothing wrong with a bit of gimp vanity – my cane is spectacular! It has taken me about six months to be totally comfortable at my own pace and situation and insisting others go ahead if that seems more comfortable. I went through a short ‘recluse’ period where I avoided going out – so glad that is over. Like you, I find certain parts of Buddhism/Taoism etc appropriate. Ian, The funny thing is, I can vividly remember when my w/c was a cane instead. I dreaded using it and avoided it as much as I could! I found this post very sobering. I spend quite a bit of time anlyzing my flaws, shortcomings, issues, etc. that I sometimes lose perspective. It’s amazing to see how basic things like walking and muscle control are taken for granted when you look at things from such a different perspective. I needed that splash of water in my face!! Thanks NiNi!! Leigha, I wish you the best in your pursuit, It took me a long time to get there. Literally and figuratively! I like your new “pimp” wheels. Keep on trucking!!! Dad, I am soooo tickled you commented. See, you can do it! I’m also dealing with muscle fading. Muscle wasting. Everywhere, not just the walking muscles. I’m also trying to expand the list of “what I can,” but it’s not coming easily to me, either. Us “neurologicals,” we have an interesting road, don’t we? Even if our condition makes the walking of it more metaphoric and less physical, it requires no less Olympian efforts. Hang in there! You got friends out here, “walking” (as best we can) right beside you. Reading “My New Normals” is very motivational for me! As I aspire daily to not feel powerless, I to find myself overcome with self-pity and anger. “Why me?”, I often ask. I have to learn to adopt this new attitude that you speak of! I have to admit that it is hard………. Kshanski, Yes indeed it’s hard. I would wonder what you were smoking if it wasn’t! LOL I’m so flattered you find the posts inspirational, but just know I have all those same emotions too. Your are allowed those feelings. I read that too! Nicole – I have to admit that I have a knee-jerk opposition response to the title “On Becoming Fearless”. My schmaltz-o-meter starts beeping although I admit it’s not fair to judge without having read the book. However, I like what you took from it: “…Instead of expecting it to go away, I tolerate its presence and keep moving forward.”I really don’t think we should unnecessarily subject ourselves to fearful scenarios when given the choice. However, like you noted, lots of times we don’t have a choice anymore. What’s my fear? I think my anger I express about interactions with bureaucracies (medical / insurance /disability) is really based on the fear that these dolts are the people who control my financial situation. Since I’m single, I was used to my efforts in my career being the sole factor that controlled my financial position in life. I’ve been telling myself to not let interactions with them (the bureaucracies) affect me so much, although I can’t let my guard down with them. The idea of just acknowledging and getting comfortable with the fear coming along for the ride sounds very Buddhist to me and doable. 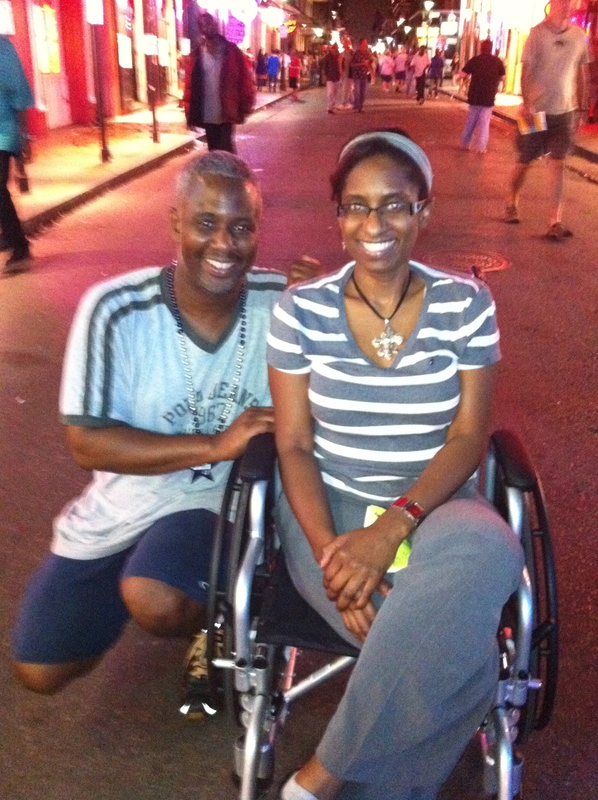 Glad to hear you got your knobby wheels – yay! Yes, it does have a Buddhist twang to it. Thanks so much for your heart felt comment. I hate To sound like an ad,but from your pasión it really sounds as if you would enjoy the book. I’m no Buddhist, but I have to admit I’ve found comfort in a few of their platforms. I have accepted that fear will always be with me I just have to deal with it.